When it comes to managing a modern business, perspective is key. Organizations operate with dozens if not hundreds of overlapping assets and processes, often to the extent that trying to predict how a single change will affect the rest of an organization can seem impossible! This is where ‘enterprise architecture’ comes in. A relatively new discipline, enterprise architecture involves making detailed architectural plans to show the makeup of organizations. However, it is not strictly the same as business architecture, as enterprise architects will also take factors like applications, data and technology into account. With a holistic picture of their operations, managers can make far more informed decisions regarding organizational change. More importantly, they can make the best use of all available resources and investments while also spotting where their current infrastructures are lacking. The end result is often an organization which is not only more streamlined, but also more than flexible enough to accommodate future changes. 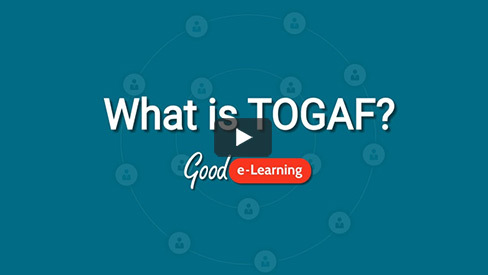 In this video, Mike from Good e-Learning looks at the purpose of enterprise architecture, as well as the basis for popular enterprise architecture frameworks like TOGAF. Good e-Learning offers an award-winning enterprise architecture course portfolio, having won the ‘Outstanding Certification Product’ prize at The Open Group Awards 2018. Instead of mind-numbing Powerpoint slides and endless PDFs, we utilize engaging online learning tools in each of our courses, including gamified quizzes, interactive videos and rich motion graphics. We even offer 24/7 tutor support to help students along, as well as FREE exam vouchers for when they are ready to gain their certifications. Whether you are new to enterprise architecture or a seasoned professional looking to update your qualifications, we have a course for you. Our TOGAF Awareness course offers an excellent introduction to the TOGAF enterprise architecture framework, while our TOGAF Foundation and TOGAF Certification packages can enable students to obtain official TOGAF qualifications. Meanwhile, the TOGAF Essentials 2018 course is perfect for certified practitioners who want to bring their certification from TOGAF 9.2 to 9.2. If you want to equip yourself with certifications for both an excellent EA framework and modeling language, we also offer courses which combine TOGAF and ArchiMate. If you cannot find a suitable course in our portfolio, Good e-Learning can create a bespoke course built around your unique training goals and KPIs.